Small size (30.78mm x 36.07mm) 18K pink gold case set with round diamonds, circular-grained crown set with a diamond, lacquered silvered dial with exterior flinqué decoration and black Roman numerals, quartz Cartier caliber 059 movement, 18K pink gold bracelet set with round diamonds. Water resistant to 30 meters. Small size (31.53mm x 36.07mm) 18K pink gold case, circular-grained crown with set with a sapphire cabochon, lacquered silvered dial with exterior flinqué decoration and black Roman numerals, quartz Cartier caliber 059 movement, 18K pink gold bracelet. Water resistant to 30 meters. Small size (31.53mm x 36.07mm) 18K pink gold case, circular-grained crown with set with a sapphire cabochon, lacquered silvered dial with exterior flinqué decoration and black Roman numerals, quartz Cartier caliber 059 movement, toile brossée fabric strap with 18K pink gold ardillon buckle. Water resistant to 30 meters. Small size (30.78mm x 36.07mm) 18K pink gold case set with round diamonds, circular-grained crown with set with a diamond, lacquered silvered dial with exterior flinqué decoration and black Roman numerals, quartz Cartier caliber 059 movement, 18K pink gold bracelet. Water resistant to 30 meters. 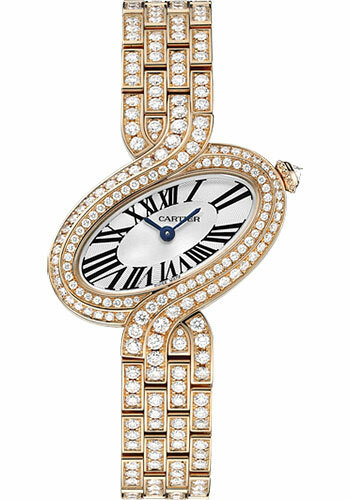 Small size (30.78mm x 36.07mm) 18K pink gold case set with round diamonds, circular-grained crown with set with a diamond, lacquered silvered dial with exterior flinqué decoration and black Roman numerals, quartz Cartier caliber 059 movement, toile brossée fabric strap with 18K pink gold adjustable deployant buckle. Water resistant to 30 meters.